To be able to truly appreciate a cup of Colombian Coffee, it is very important to know the work and effort of many people towards assuring the quality of the final product for the consumers in the world. The union of those efforts has allowed building, after many decades, a system that backs up this unique product hardly replicable by any other origin of coffee in the world. The selection processes begins at the research on varieties and ways of cultivation that are carried out by the scientists at Cenicafé, probably the most advanced research center on coffee in the world. The coffee people in Colombia more than 500.000 coffee producing families in the country, receive the information from Cenicafé and the advice to assure the quality of their crop through the extension service (see the Colombian Coffee Growers Federation site). 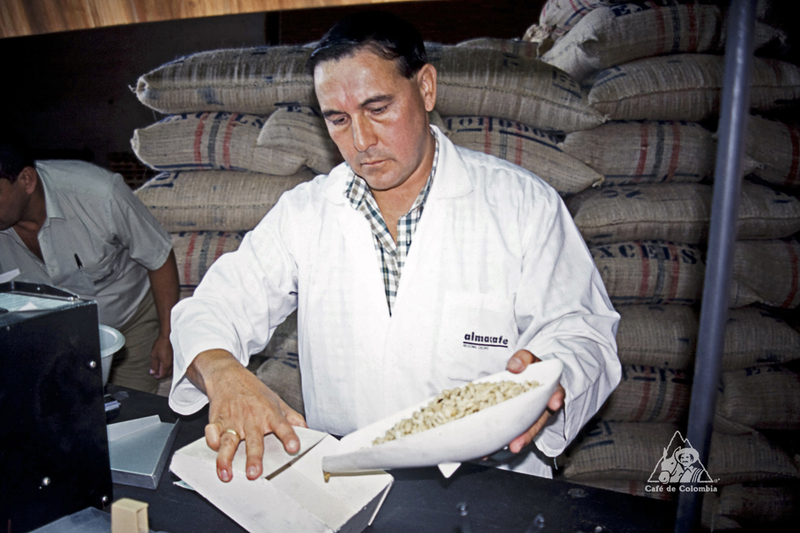 To meassure the importance of the work of the Colombian Coffee grower and his or her family, it is worthwhile to underline that to produce a pound of roasted Colombian Coffee 453 g or one American pound) one first needs to select around 1,700 coffee cherries or coffee fruits in optimum condition of maturity. The selection and beneficio (the process of post harvest that includes depulping, washing and drying - see about coffee section, a special product) of coffee cherries constitutes without any doubt one of the most arduous, meticulous, and personalized jobs of the whole coffee production chain. It is in those processes when a high quality coffee is obtained. One has to remember that to recollect the number of mature fruits needed to obtain a pound of roasted coffee it is necessary to wait patiently the production of one coffee tree during a whole year. In the case of the less productive varieties that produce shade grown coffee, it is necessary to obtain the fruits from more than 2 coffee trees during the same year to obtain the same pound of roasted coffee. The art of producing a good Colombian Coffee with selective recollection and beneficio is an act of craftsmanship and a patient job that not many consumers know and value in its fair dimension. But besides patience, there is also hard work. A coffee producing family in Colombia has an average production equivalent to 1,400 kilos of green coffee every year, that is to say around 2,600 American pounds. To produce that volume of coffee it is necessary to select at the harvest process the equivalent to around 5.2 million coffee cherries, which also have to be washed and dried to obtain a quality product, discarding the defective beans along the way. At the end of those initial tasks the so called parchment coffee is obtained. It is at this point when most Colombian producers take their product to the internal marketing network in the country. The dried parchment beans are milled or thresh to have the yellow coat removed to obtain the green coffee seeds. Once the parchment is removed at the threshing machines, the bean is once again carefully selected and classified, taking into account its size, weight, color and physical appearance (defects). 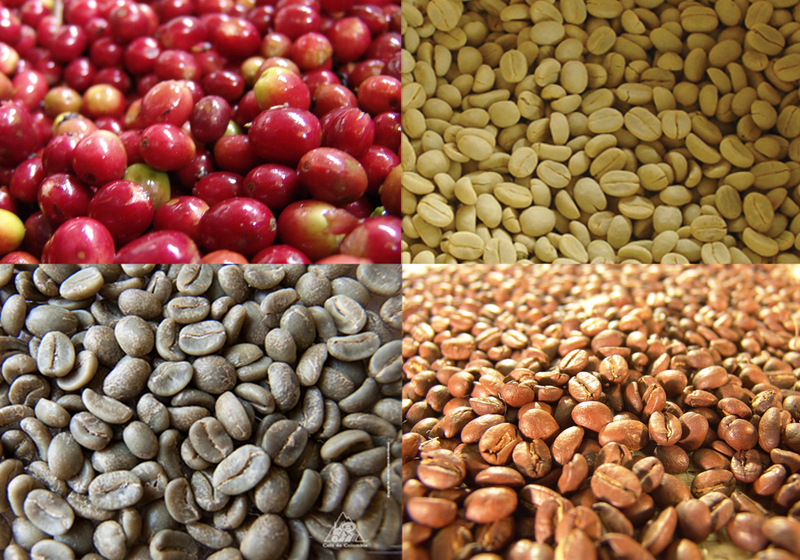 That green coffee beans have a characteristic smell of fresh coffee and an average humidity between 10 to 12%. They are used for the elaboration of roasted coffee, soluble coffee and coffee extracts in the industrialization processes. In order to have this green coffee exported, it must have gone through different points of analysis of sensory quality, granulometry and humidity in accordance with the existing regulations in Colombia (see national regulation). A Colombian Coffee can only be exported if it meets all the minimum existing quality parameters, which are checked over at all the ports where the coffee is exported in Colombia. That task is carried out by Almacafé. To be able to assure the quality, the efforts of Colombian Coffee growers do not end at their territory. Through the 100% Colombian Coffee Program roasting companies in all continents buy their green Colombian Coffee and sell it under their 100% Colombian Brands to consumers in the whole world. In laboratories of quality control in different continents, Colombian growers carry out quality reviews for each one of those brands to assure that the product is consistent with the quality standards required and that brands meet the regulations that would guarantee the origin. Colombian Coffee can also get to your cup at a coffee shop or a restaurant that buys or uses roasted Colombian Coffee. Colombian coffee growers, trying to generate a better knowledge of their effort and their origin, have also developed their own Juan Valdez coffee shops with the purpose of promoting their product and to give the consumer a friendly message associated with their effort, respect and dedication for the beverage. It could be easily said that before a lot of Colombian Coffee is exported it has gone through at least 4 points where its quality is analyzed and evaluated from the farm up to the exporting port. In addition to this, through companies specialized in sampling and laboratories contracted to that effect, further analysis are carried out in all continents. Approximately 1,200 quality analysis per year are performed for Colombian Coffee brands sold outside the country. Thus, Colombia has become a worldwide reference in terms of coffee, due to its obsession to build a system to assume quality , which starts in the seed of the tree (associated with the work of Cenicafé)and finishes in the 100% Colombian Coffee cup that gets to millions of consumers in the whole world.